RECTOR, Ark. — Informal surveys of Arkansas growers’ top concerns at the beginning of each planting season typically yield a variety of answers, from the best use of available acreage to marketing strategies for every crop. 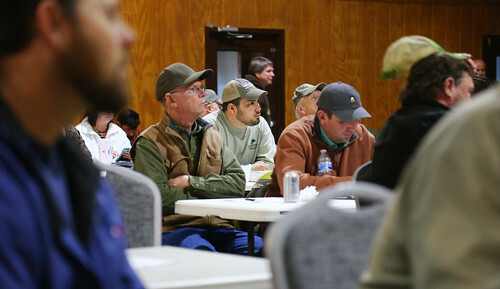 But for 2019, the consensus among growers attending one of the year’s first row crop production meetings in northeast Arkansas boiled down to one word: Money. It was literally the first word from the mouth of William Rasberry, a cotton farmer who works about 900 acres just across the Arkansas-Missouri line, in Dunklin County. Row crop production in the Mid-South, and agriculture in general, is always a struggle for profitability. But in 2019, growers are looking at a particularly uphill sort of battle, as the cumulative effects of long-depressed commodity prices and an ongoing trade dispute with China are met with the current state of winter fieldwork as yet undone. The same intermittent wet weather conditions that caused the 2018 harvest to drag on interminably bled from fall into winter, and prevented most growers from completing (or often, even starting) field preparation in January, including fertilization, tillage and leveling. Scott Stiles, extension economist for the University of Arkansas System Division of Agriculture, said that in and of itself will add to growers’ expenses. The “China question” also looms large in the minds of growers and other industry professionals. “There’s a lot of uncertainty right now around the trade discussions with China,” Stiles said. “That’s on the top of growers’ minds at every meeting I’ve been to this month. They’re closely watching those talks. There’s a lot riding on that for soybeans, as well as cotton, corn, wheat — all crops. “The state of the trade dispute is keeping growers’ plans in a state of flux.” He said. “People aren’t able to decide how they want to shift acres, because so much is riding on the China talks. Due to the partial shutdown of the federal government in December and January, the U.S. agricultural industry was without government data from the U.S. Department of Agriculture and other agencies for more than a month. for 35 days. Growers will be closely watching the release of a major crop report from the U.S. Department of Agriculture today, which has “huge potential to move markets,” Stiles said. One effect of the ongoing trade dispute with China is the accumulation of soybean stocks, which are now projected to reach record high levels. That may keep soybean prices at depressed levels, and ultimately affect growers’ acreage decisions regarding the state’s No. 1 crop. To learn about row crop agriculture in Arkansas, contact your local Cooperative Extension Service agent or visitwww.uaex.edu. Follow us on Twitter at @UAEX_edu.